Universal DNA Marker contains 10 DNA fragments, 10,000 bp, 5,000 bp, 3,000 bp, 2,000 bp, 1,500 bp, 1,000 bp, 750 bp, 500 bp, 250 bp, and 100 bp. This is a DNA solution with 1 × Loading Buffer. Directly load 5 μL Universal DNA Marker to electrophoresis gel when using. The 1,000 bp band is 150 ng / 5 µL and much brighter than the other bands as a visible reference indicator. 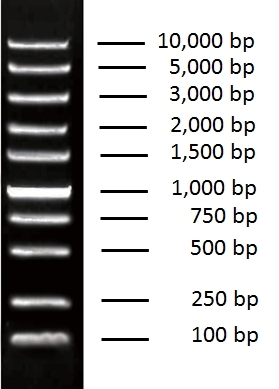 The other DNA bands are ~ 50 ng / 5 µL. Load 5 µL of Universal DNA Marker to the agarose gel (If the sample hole is larger than 6mm, increase the sample volume proportionally) and run electrophoresis. Ship at 4℃. Store at -20℃ for up to 2 year. For frequent use, store at 4℃ for up to 6 months. Avoid freeze-thaw cycles. The gel image shown is 5 µL of Universal DNA Marker separated by 1% agarose gel. Do not heat Universal DNA Marker before loading. Please use fresh electrophoresis buffer and agarose gel for the best result. High quality agarose should be used to avoid effecting the DNA bands and the recommended agarose gel concentration is 1% ~ 3%, recommended voltage is 4 ~ 8 v / cm. The separation performance of DNA fragments in agarose gel is related to gel concentration. The higher concentration gel separates shorter DNA fragments better. The lower concentration gel separates longer DNA segments better. This product is not for diagnostic use. The safety and efficacy of this product in diagnostics or other clinical uses have not been established.